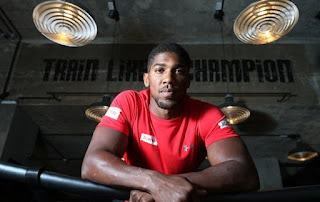 Anthony Joshua has revealed the 'massive' sense of disappointment he felt when Wladimir Klitschko announced his retirement and ended their plans for a rematch in Las Vegas. Klitschko's unexpected announcement, at the age of 41 following his stoppage defeat by Joshua at Wembley, surprised the boxing community as much as Joshua, particularly as he believes the Ukrainian had more to give. Immediately after April's fight Klitschko insisted he could have finished Joshua after heavily dropping him in the sixth round and had made a mistake by remaining patient. '(Floyd) Mayweather's the same age as Klitschko (the American is actually 40), Mayweather's still going strong; Klitschko still had a good fight in him (in April's defeat) and I'm sure he's still got a couple of other good fights in him. 'In my heart of hearts I kind of knew he probably wouldn't fight again. He was saying how obsessed he was with becoming heavyweight champion of the world again. 'If you fail at the first hurdle, you go again; you knew from my side I was ready for a rematch, making it clear that if he wants to go again, we'll go again. 'With Klitschko, we weren't hearing too much, so I just thought he was 50-50, but I had a feeling he might not fight again.